Authentic Italian dishes and unique pizza selections. With authentic Italian dishes and unique pizza selections. Sal’s pizza’s executive chef Dana believes in “from scratch” is always the way to go. From our chicken stock to cookies to bread. Having a culinary background & a culinary arts degree theres always something different & authentic to try at Sals. Aldo’s creativity with Pizza always has customers calling to make sure their favorite slice is available. If not Aldo always goes the extra mile and makes it for them. Come down and give us a try & don’t forget to say Hi!. Our grandma-style thin crust pie topped with fresh tomatoes & slices of fresh mozzarella with fresh basil. 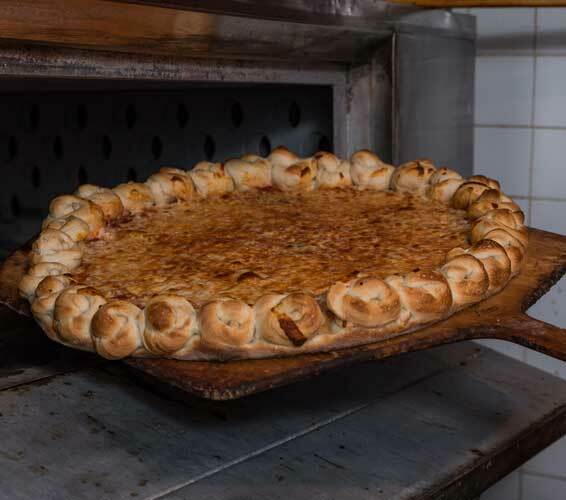 One of Sal’s signature pizzas, this is a traditional pie with a hand-made, garlic knot crust. Pizza dough wedge rolled with tomato sauce & mozzarella cheese Chicken • Eggplant • Spinach • Broccoli • Buffalo Chicken • Sausage & Peppers. Three hot, delicious, garlic knots for only a dollar. How can you go wrong? Why not get a dozen?